Homer finds the inspiration to be a good dad—and it’s in bar form! On the surface it’s easy to throw that phrase at “King Of The Hill” any number of times, as the episode’s description reads as a regurgitation of plot points from the last eight seasons. An episode where Homer disappoints his son by being less than an ideal father? Simpsons did it. An episode where Homer realizes he has issues with his weight? Simpsons did it. An episode where corporate greed gets in the way of doing the right thing? Simpsons did it. 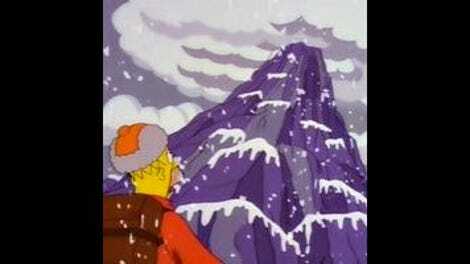 Homer climbs a mountain? Simpsons did it. A strange dream sequence takes over part of the episode? Simpsons did it. It’s an exhibition of recycled stories that could in theory be used as an exhibit of the show losing its way. How, then, is “King Of The Hill” such a reliably entertaining episode of The Simpsons? Well, it starts from the strong position of having a script from legendary writer John Swartzwelder, who wrote more than a few of those previously used stories and is clever enough to not simply reiterate his greatest hits. It’s an episode that has the trappings of prior plots but connects them in all in a strong central narrative, and shows an awareness of characters and emotional resonance that some season nine episodes had started to lose sight of. The methods by which he does so are also very in keeping with established Homer behaviors. Homer’s easily led by trends, particularly ones involving food, so when a potential super health bar named Powersauce comes along, it makes complete sense that he’d latch onto it so heavily he’d eat $50 of bars a day and believe that bar form is the highest form of food. (This also produces the episode’s best joke: “That’s why I’m compressing five pounds of spaghetti into one mouth-sized bar! … Hospital please.”) And while it’s a bit contrived to have big-time movie star Rainer Wolfcastle working out in the same gym (or “gy-me” as Homer puts it), it’s a reliable piece of connective tissue to the opening scene where McBain’s abs stood in contrast to Homer’s can-crushing gut. Plus, it only deploys him in small doses as opposed to focusing on the two’s potential friendship, keeping the story’s focus centered wholly on Homer and his journey. 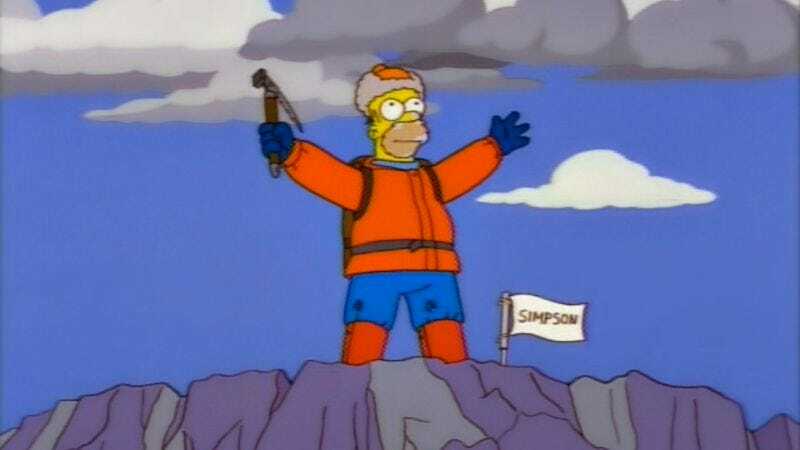 Swartzwelder’s script cleverly meshes all of those points together for the second half of the story when a newly impressed Bart eagerly volunteers his father for a Powersauce publicity stunt to climb the Murderhorn, Springfield’s highest mountain. (A mountain whose size is illustrated in classic Swartzwelder visual gag fashion, when it turns out there’s always something bigger to the right.) It’s a crazy idea, but the episode is fully aware of how crazy it is, getting a touch meta in the reactions. Marge asks if anyone’s pointed out that Homer’s totally unfit to climb a mountain, and the Powersauce rep honestly says “Well, yes, a number of people” before moving right along. What also helps keep the tone of the endeavor on point is the persona of the Powersauce representatives spurring Homer onto this task. Brendan Fraser and Steven Weber do excellent voice work as Brad and Neil, so high on their company’s brand they’ll create their own newscast to tell people about Homer’s adventures. “Brad, could Homer have made it this far without the engineered nutrition of six kinds of apples?” “No way, Neil!” These guys are believers in their brand first and foremost, and everything behind it—be it the fact that Homer’s Sherpas are dragging him up the mountain or that the secret ingredient is Chinese newspapers—is irrelevant. Even at the last moment, all they can do is pivot to blaming Homer’s certain death on a switch to the Vita-Peach Health Log. However, where “King Of The Hill” steps up its game is once the Powersauce element is shed and it becomes Homer against the elements. Yes, this is the second time Homer’s climbed a mountain in the last two seasons, but unlike his adventure on “Mountain Of Madness,” there’s no Mr. Burns for him to focus his ire on and no political powers to call on. This time around, his brain snaps into fantasy territory thanks to a thin atmosphere, an with yetis and mountain goats and bubbles. The music and animation call up the memory of prior dreams like the Land of Chocolate or his sleep-deprived drive into the clouds, and like those it works because it comes completely out of nowhere. Also like those earlier fantasies, it juxtaposes the joy with unpleasant reality. Dan Castellaneta puts so much into Homer’s reactions here, his anticipation and pain as things get worse and the force of his “AW CRAP!” upon seeing the true height of the Murderhorn. The macabre reveal of his father’s former climbing partner in the cave only further reemphasizes the thread of father/son disappointment that’s run through the episode (“Ew, dad” is another highlight delivery), and his move to put the Simpson flag as far as he’s gotten is done with such resignation that when it inadvertently takes the peak off the Murderhorn and gets him to the top by default, it becomes triumphant. Homer gets a win out of this whole process, and it’s a win that he worked for and a win that he deserves. In the end, both Homer and “King Of The Hill” stick the landing: the former thanks to appropriating McCallister’s corpsicle as a sled, the latter because it comes around to what the episode was about. Homer admits to Bart before climbing that he’s only doing this for his son (a move that Bart’s fully on board with), and even though the Simpson flag is blown off, the two get to have a legitimate moment. Well, at least until Marge takes a look up and asks “Is that your wallet?” It undercuts the heartfelt part of it but not so much that it turns into a downer, the right note to close this perfectly balanced episode. It’s an appropriate couch gag this week as the family gets shaken up in a snow globe the same week Homer has to scale a snowy peak. This episode contains a lot of great individual moments for secondary Simpsons characters. Mr. Burns deploying his Rolls Royce in a game of tag, Dr. Hibbert’s unnecessary diagnosis of McCallister, Apu sleeping standing up and able to greet his customer by name the instant he wakes up, and Comic Book Guy’s need to find a new Fortress of Solitude. And Bart didn’t even wind up picking Milhouse last for capture-the-flag. Homer’s various belly jiggles are well-animated to demonstrate just how much work he has to do. Agent Scully was right, it’s like a lava lamp. “I’m not the one who puts butter in their coffee!” Homer was several years ahead of the Bulletproof coffee trend, it seems. Though I doubt there’s going to be a march to put him on the poster as an advertisement of its mental health benefits. Next time: Only two more to go this season, but if you don’t think Zack Handlen’s up to the challenge of reviewing the penultimate episode “Lost Our Lisa,” you don’t know Zack. I mean, he’s so smart they hooked him up to a big computer to try to teach it some things, but he had so much knowledge, it overloaded, and then it got really hot and caught on fire!